Research | Convergence - Data Analytics for Hedge, Private Equity, Venture Capital and Real Estate Funds. 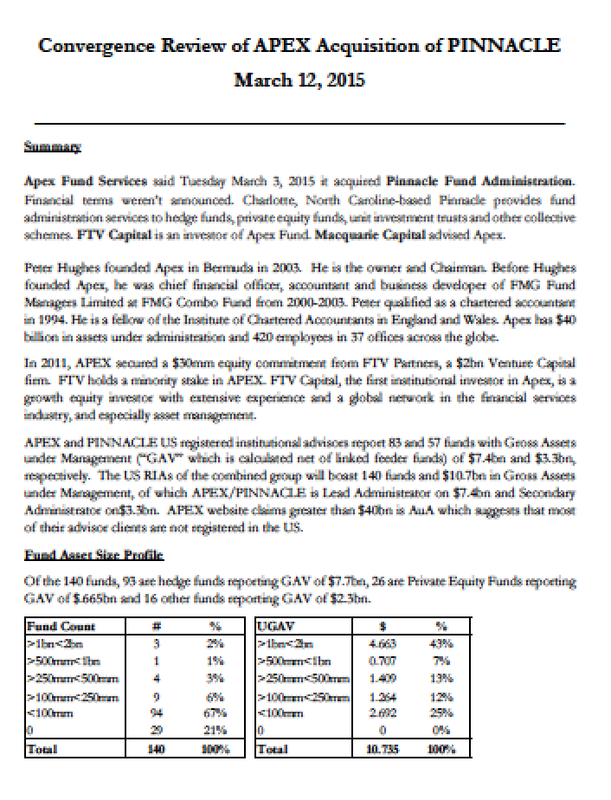 Audio: HEDGEYE Webinar – Is the Hedge Fund Business in Trouble? 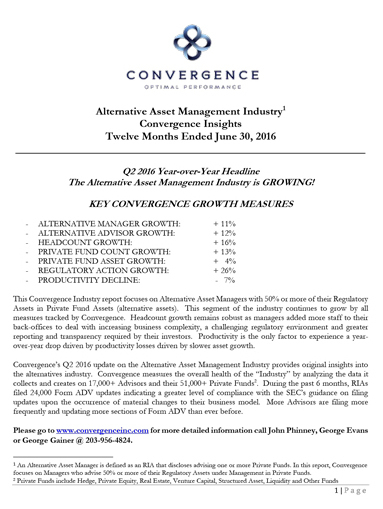 Alternative Asset Management Firms Continue to Grow! Are you a college/university undergraduate or Alumni interested in researching the Alternative Asset Management Industry? 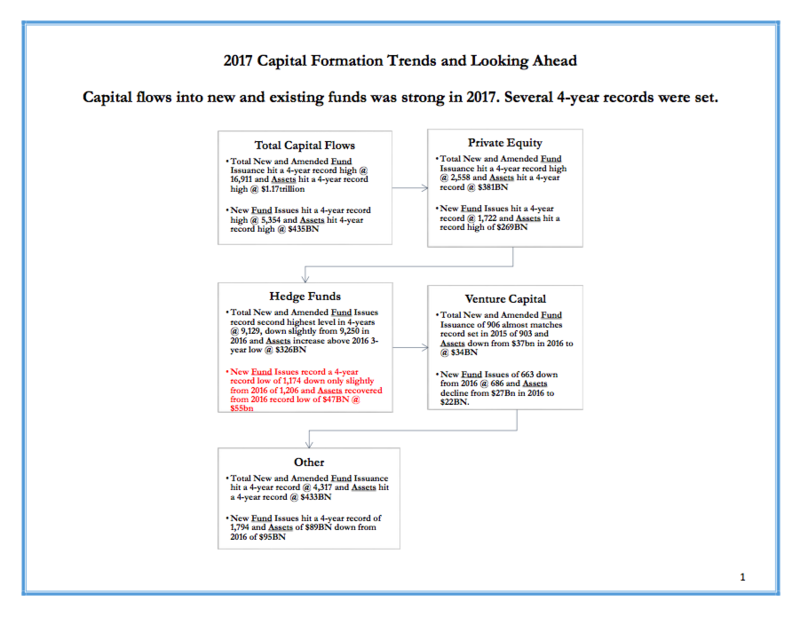 Capital flows into new and existing Hedge Funds, Private Equity Funds, Venture Capital Funds and Other Funds set 4-year records and recovered from 4-year lows. 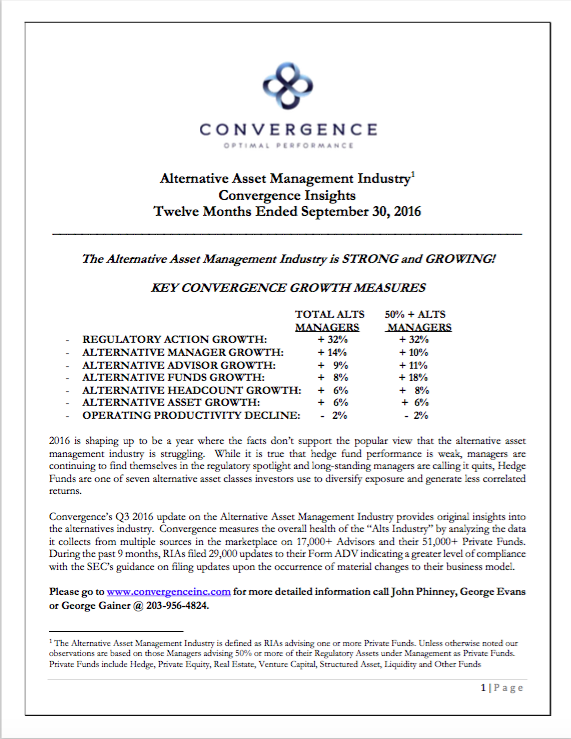 The Alternative Asset Management Industry is GROWING! 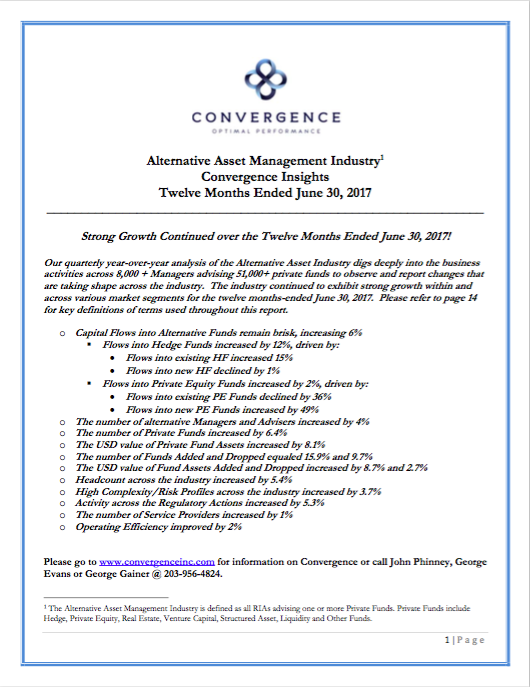 Convergence Chairman John Phinney recently spoke with HEDGEYE in a recorded interview –LISTEN HERE. No download necessary. 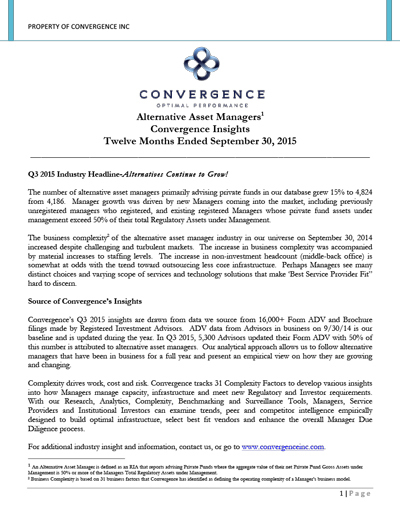 Q3 2015 Industry Headline-Alternatives Continue to Grow! The number of alternative asset managers primarily advising private funds in our database grew 15% to 4,824 from 4,186. Manager growth was driven by new Managers coming into the market, including previously unregistered managers who registered, and existing registered Managers whose private fund assets under management exceed 50% of their total Regulatory Assets under Management. The SEC requires Registered Investment Advisors to disclose in Part 2 of their ADV, the brochure, “any other types of fees or expenses clients may pay in connection with their advisory services” using clear and plain English as described in their “Writing Clear Brochures.” Handbook. The intent is to provide readers with a clear and concise view into expenses investors may incur if they invest in one or more of the Advisor’s funds. 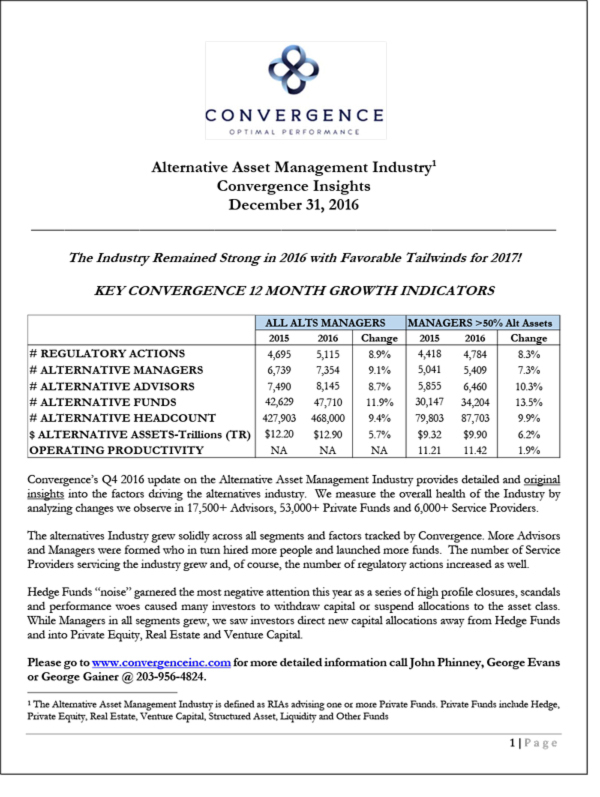 Convergence, a leading data analytics and advisory services company, announces its Q2 update of the State of the Union of the Alternative Asset Management Industry. The report focuses on business trends among alternative asset managers, related assessments of changes in operating complexity and risk, and changes in operating productivity. The data is sourced from SEC filings and enriched to provide a unique view into the infrastructure of over 15,000 RIA's. There were over 5,600 individual Advisor filings in Q2 2015." 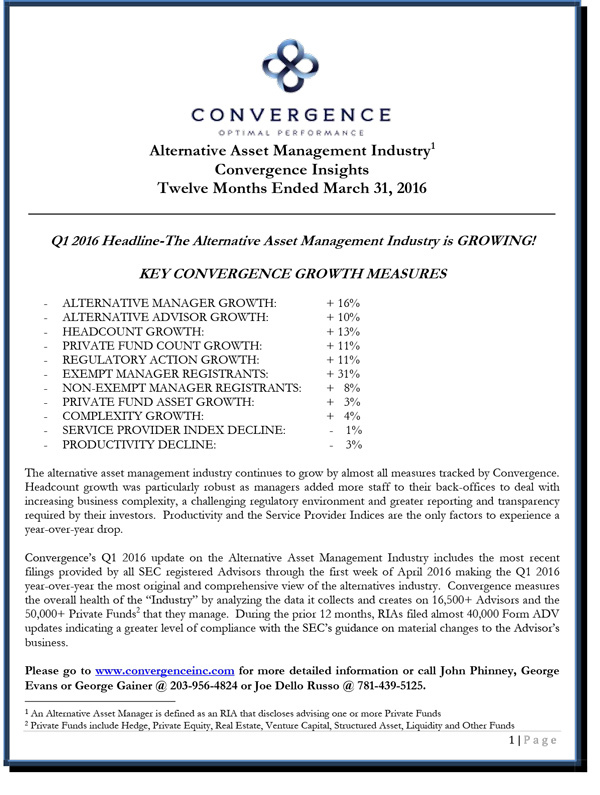 Convergence is pleased to present our 2015 annual research insights into the Alternative Asset Management Industry. Our data and analytics are sourced from 15,000 Form ADV’s and Brochures filed by Non-Exempt and Exempt Investment Advisors for the 12 months ended March 31, 2015. Our report focuses on business trends among alternative asset managers along with related assessments of changes in operating complexity and risk, and changes in operating productivity. During the first quarter of 2015, 11,981 Advisors filed updated ADV’s, or 79% of all advisors. And during the year, 21% of all Advisors filed updates citing material changes to their business model. Infrastructure professionals responsible, in whole or in part, for conducting human resource functions perform work critical to the successful start-up and ongoing management of alternative asset management firms of all sizes. Yet their ability to objectively measure the financial value of their work, what Convergence calls “infrastructure alpha”, is less obvious than the financial value created by investment professionals. In most firms, determining whether human resources is doing a “good job” is more subjectively than objectively measured and when they perform poorly, well it's quite obvious. Using infrastructure alpha to monitor HR’s progress will help them optimize their performance. 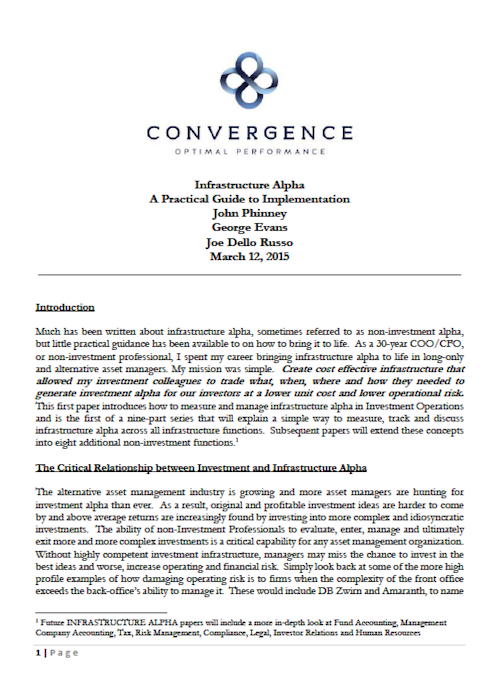 How to measure and manage infrastructure alpha in investment operations is the first of a nine-part series of White Papers from Convergence, Inc. “Infrastructure Alpha: A Practical Guide to Implementation,” provides straightforward guidance on how to measure, track and discuss infrastructure alpha across all operational functions of a company. Convergence’s introduction of infrastructure benchmarking data helps Asset Managers readily measure the performance of their infrastructure. Asset Managers use Convergence benchmarking data to identify specific opportunities to reduce Management Company and fund expenses. Operating Expense Ratios are often an area of focus for new and existing investors, portfolio managers and Fund regulators. 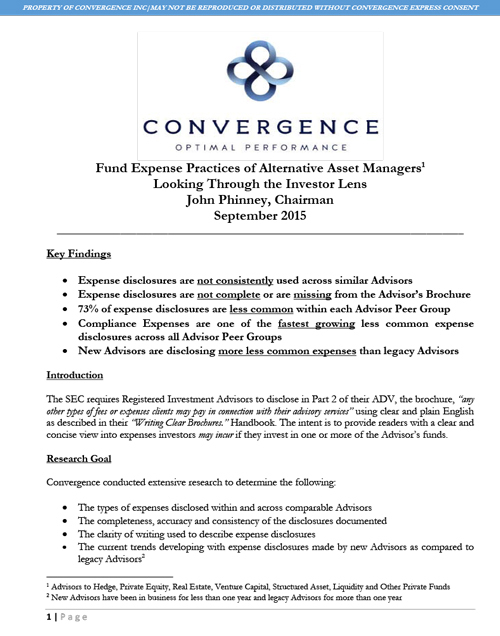 Convergence's deeper inspection of expenses in Funds of similar size and strategy has revealed important information about the Manager's investment and infrastructure practices. 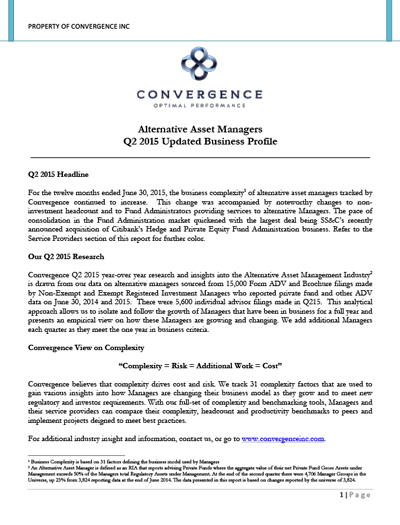 Access to Convergence Research documents including Alternative Asset Management updates, whitepapers, and more.